We don't know for sure too much about Miguel de Cervantes. For example we know with certainty the date of his death (04/23/1616), but the date of his birth is mere supposition (09/29/1547). And despite his Quixote was spread with celerity, he was only considered a great writer when more than a hundred years had passed since his dead. In fact, his first biography was written in 1737, and it's from that moment when is searched with interest any information that lets us know something about his person. For example: his face. This first written description dates from 1580 and is therefore a description that is made when he was alive. This way was described by those who rescued him after spending five years in prison. The second description was written by Lope de Vega, but only says about him the previous words. And it seems that Cervantes wore glasses, when no one has portrayed him like this yet. This third description is from the prologue of one of his works and it was written by Cervantes himself. 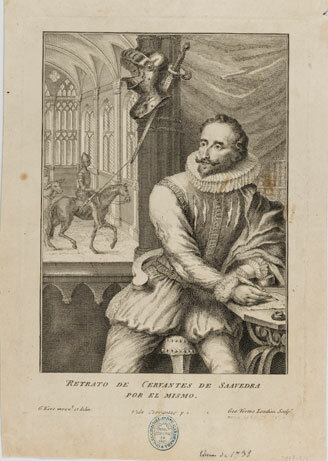 The first time that someone decided to portray Cervantes was in 1738. This portrait was done by an english engraver and was included at the beginning of the first english translation of Don Quixote. This first portrait has some remarkable features. His left hand doesn't look like a human hand. It looks strange and is lying, inert, on his other hand. This was the way the engraver wanted to express his disability. In a preferred place there are a helmet and a sword, probably the engraver had drawn these war tools to emphasize his condition of soldier. Cervantes is portrayed writing and imagining with his lost gaze, almost directed at the figures of a Don Quixote on horseback followed by an almost imperceptible Sancho on a donkey. But as the artist was english, he locates them at the interior of what seems to be a hall of an english palace, and not in the Castilian Mancha. Cervantes has also been depicted in sculptures such as the one on the facade of the National Library in Madrid, which took place in 1892. This is a whole-bodied statue where the same symbols (books, sword on his belt and a shield) are repeated, reflecting the two most important facets of his life: the military and the writer. The last notable image that has been dedicated to him is the work of the painter Ferrer-Dalmau. He is a current painter who has focused on paintings that recreate historical facts and great battles. In this case shows Cervantes as a soldier who participated in the battle of Lepanto. 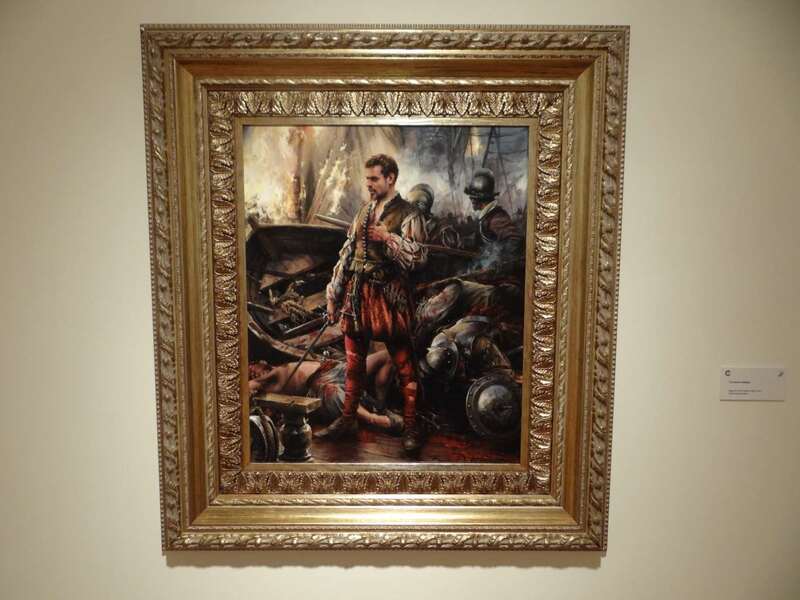 The picture was exposed in the City Hall of Alcalá de Henares in 2016, during the events of the 400th anniversary of Cervantes' death. However, none of the previous works could be made taking Cervantes as a model because all have been executed a long time after his death. Only the painting on the left could have been done with Cervantes as a model. In the lower panels you have more information about this painting, click on to fold or unfold them and learn more about the most popular face of Cervantes. The name of “Miguel de Cervantes” appears in the upper part, and in the lower part, the name of the author of the painting and the year: 1600. And, in fact, the one who signs as author of the painting Juan de Jauregui was a Sevillian painter who lived at that time. In addition Cervantes was in Seville in several occasions, so by what appears in this portrait that could be the face of Miguel de Cervantes. No one knew anything about it until 1910, when the valencian painter and restorer José Albiol, meets the president of the Biblioteca Nacional de España and tells him that he has long owned a lot of paintings acquired in Seville and among them there is one that seems to be a portrait of Cervantes. The director of the BNE, comes to see it and is convinced of its authenticity, because until that moment we could only intuit what Cervantes' face was for written descriptions. The president of the Biblioteca Nacional knew Cervantes' description of himself and the traits of the description were coincident with those that appear in the picture of Juan de Jáuregui. That was what convinced him. And also because José Albiol didn't ask for money for the portrait, instead told him that his intention was to donate it, because it was the only reliable portrait of Cervantes. In 1912 it is announced with great rumor that, at last, we have a real image, a reliable portrait, of a painter who surely made him a portrait in life. Some people were not convinced, but only a long time later tests were done with more precise methods and the falsity was discovered. Although the picture contained old pigments, there were also very recent ones. Although its obvious false, since we have no other better, today it's nothing less than presiding the plenary hall of the Real Academia de la Lengua. Previous information extracted from the dossier made by the professor of the Department of Spanish Language of CEEDCV, José Miguel Marín. In 1575 Cervantes was a soldier who travelled across the sea from Italy to Spain. At the point of reaching his destination, he was captured by north african pirates and transferred to Algiers, where he was imprisoned. After five years of captivity, he was freed by trinitarian friars. He arrived by boat to Valencia, following a stopover in the port of Denia, on 30 October 1580. At the end of the XVI century Valencia was a walled city, separated from the coast and the port. 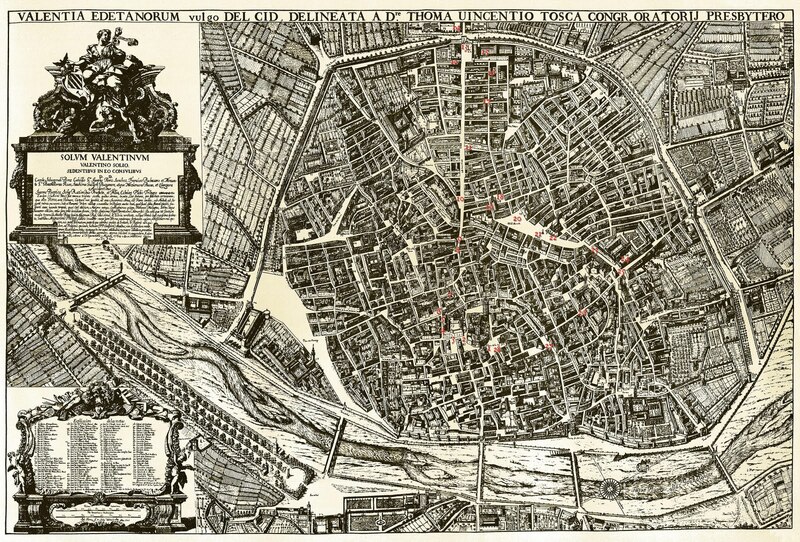 The soldier and writer from Alcalá spent a month in Valencia. Find out the places he visited on the right page. After his rescue, Cervantes spent a month in Valencia. He stayed in the convent-hospital that the trinitarian friars had in the Pla del Real, on the outskirts of the city. Cervantes and the other liberated captives undoubtedly participated in a solemn procession to the cathedral, where a religious mass was offered and a Te Deum was sung as a thanksgiving for liberation. In those times, theater was a mass spectacle; therefore, it's very probable that during his stay in Valencia, Cervantes went to some representation in the small corral of comedies of San Narciso in the street del Salvador. During the month of November 1580 Cervantes is asked to testify in a lawsuit in the Casa de la Ciudad. This was placed in the small garden next to the Palau de la Generalitat. Very close to Plaza de la Reina, at the beginning of San Vicente Street was another place that Cervantes had to visit: the printing workshop of Pedro Patricio Mey, where 25 years later the second edition of Don Quixote was printed. Today we still remember it with a plaque placed by the City Council on the third centenary of the edition of the novel. Finally, we can imagine that the newly freed soldier must have marveled at the sight towering Torres de Serranos. Several centuries later, before the bombings in the city of Madrid during the last civil war, several boxes with the most valuable documents of the national library were transferred and deposited in these towers next to the river Turia. Among them was the only copy that this institution preserved of the first edition of Don Quixote. Previous information extracted from the video made by the Department of Spanish Language of CEEDCV. Palau de la Generalitat, aerial view. Elaboration: Google Maps. Valencia. Palau de la Generalitat. Plate of the City Council of Valencia. Elaboration: Department of Spanish Language of CEEDCV, 2016.